The Valley Wells copper smelter milled ore from surrounding mines, and was a shipping point for incoming goods and outgoing products. Ore processed at the smelter came from the Copper World mine as early as 1898, first by 20-mule team and later by tractor and trailer (Vredenburgh, 1996a). The two ore bins at the Copper World mine were for different purposes (Labbe, 1960): the larger held copper ore, and the smaller held iron and lime for fluxes at the Valley Wells smelter. Sulfur, to charge the smelter, came from the Francis copper mine in the southern Providence Mountains and from Utah (Vredenburgh, 1996a). The assay house and pyrite from the dumps were removed by the EPA in late 1990s because of arsenic (arsenopyrite) with the pyrite. We are looking at the remains of the 1917 blast furnace foundations, acid tanks, and slag. The slag was poured hot into forms that developed a flat, working floor when it cooled. The iron arsenate scorodite at the Valley Wells smelter suggests that some ore processed here came from the Mohawk Mine. The copper milling process involves trucking ore to orebin above the crusher. Upon crushing, it was sent by belt conveyor to a ball mill for fine grinding. Iron pyrite was roasted in the adjacent sulfuric acid plant, and sulfurous gas mixed with the fine ore. The ore was washed and filtered, and the copper sulfate solution ran through tin cans in a series of concrete tanks (launders). The copperiron mud was taken to the adjacent smelter or shipped as concentrate (Labbe, 1960). The smelter produced copper matte, which was first hauled to Manvel (Barnwell) and later to the new (closer) rail head at Ivanpah. After 1917, the copper matte was hauled to Cima and shipped by rail for further refinement at Garfield, Utah. 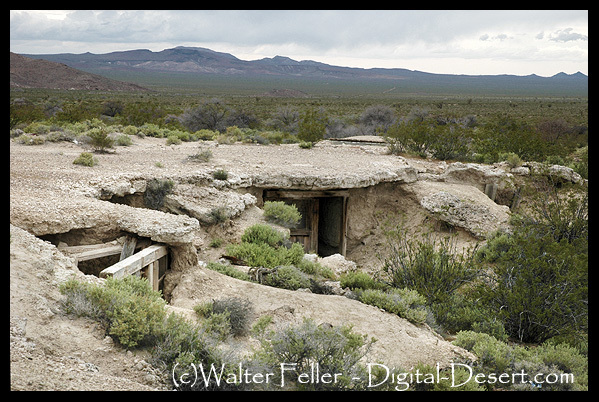 The community surrounding the smelter included wooden buildings and cabins excavated under a roof of Pleistocene caliche. Rosalie was the post office (Vredenburgh,1996a).